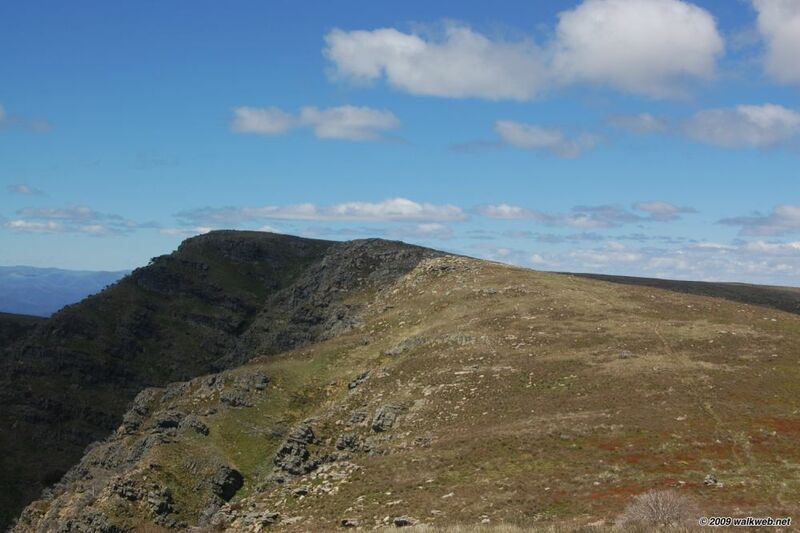 Mt Howitt is a major attraction of the Wonangatta-Moroka unit of the Alpine National Park, with sweeping views in all directions, including of the impressive Crosscut Saw. This moderate day walk is a highly recommended Victorian bushwalk. The walk commences at the Upper Howqua camping area. The path follows the Upper Howqua road for the first 3.5 kilometres. The road, which was closed some years ago (you used to be able to drive to the base of Howitt Spur), is easy to follow. There are however three fords required – the bridges marked on the out-of-date Vicmap have long since collapsed. Eventually the road meets a small clearing and a signpost. Ignoring the overgrown vehicular track that climbs to the right, cross the clearing and then the Howqua River to join the Howqua Feeder Track footpath, which soon becomes quite distinct. From here it’s about 4.5 km to the summit. The path climbs moderately at first before getting steeper as it approaches the tree line. West Peak is reached first and there are magnificent views. It’s an easy walk to the summit of Mt Howitt from here. From Mt Howitt summit you can return the same way. [Alternative return: Walk downhill north-east from Mt Howitt along an obvious path to a track junction, taking the left (north-ish) branch slightly uphill along the first part of the Crosscut Saw. Continue along for about a kilometre to a saddle where a faint foot track proceeds off to the left (and was marked by a small cairn when I was there). Follow this path – it soon descends steeply along Stanleys Name Spur and eventually will reach Queen Spur Road, an old logging road which is now overgrown. At the road, turn left (south) and follow it back to the clearing at the base of Howqua Spur and then back along Howqua Spur road to the start. Access: The Upper Howqua camping area is reached via Mt Stirling – take the road to Telephone Box junction and then follow the right-hand branch of the Stirling Circuit Road until it reaches a junction with Bindaree Road. Follow Bindaree Road until it meets the Upper Howqua Road, turn left here and the camping area is reached almost immediately. The road should be passable by 2WD vehicles in dry conditions. I’m thinking of a walk in this area shortly. How was the Upper Howqua Valley, Howitt Spur, Stanleys Name Spur, in terms of bushfire damage? I understand there were fires in this area back a few years, but maybe I am mistaken. The Upper Howqua Valley and Howitt Spur did not appear to have any significant bushfire damage, however Stanley’s Name Spur, particular the bottom section before it hits Queen Spur Road was definitely badly damaged – the path over this section has been completely obliterated, as have any track markers that may have existed. In year 11, our outdoor ed class did this walk, although we did it in a clockwise direction. was definetly great fun, and a great challenge getting up to the spur! Yes, it is a great challenge and indeed a great walk. Clockwise is probably the best way to do the full circuit at the moment.